As Dr. Montessori tells us, the greatest task for a child between the ages three and six is Self-Construction on an active and conscious level. The lessons and materials presented to children in a Primary Environment are designed to respond to the particular needs of each child during this important period of their development. In Montessori these are referred to as “Sensitive Periods”. These are periods of time during which the child is powerfully drawn to master certain skills. Some of these Sensitive Periods include order, movement, exploration of language, mathematical concepts, writing, reading, and the need to understand and be a part of the culture in which they live. Dr. Montessori’s understanding of the child’s need to repeat, their predisposition toward self-motivation, independence and mastery helps us to design a community that best provides opportunities for the individual child to learn, grow, and become a well-functioning member of their social group. Our school has three classrooms at the Primary level, each taught by one AMI certified Montessori teacher and an assistant. Each classroom serves between 24 and 35 children, ranging in age from 2 ½ to 6. Efforts are made to maintain an even ratio of boys to girls among the mixed-age groups. The children attend school five days a week from 8:30 am - noon, until they are ready for our full day program which typically happens between the ages of four and five. We offer extended care for our youngest children beyond noon if necessary. Our goal is to help children achieve independence and learn to become contributing members of society. We place emphasis on the role that humans play in protecting our Earth and we offer the children the opportunity to spend time outdoors every day. Our seven acre campus offers a variety of ways to interact; both formally through lessons and informally during daily recreation, both with the intention of being stewards of our Earth. Please click here for "Primary Years" publication. 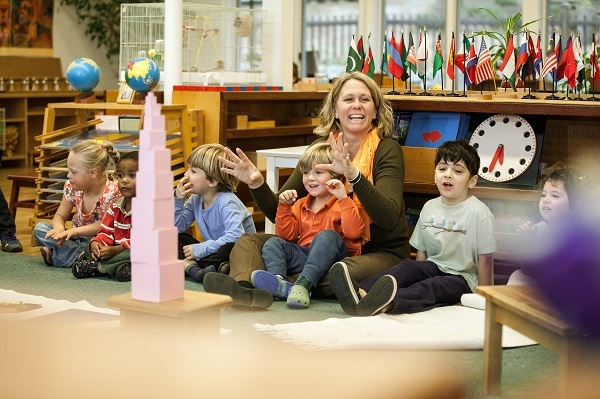 "In many ways, Montessori has partnered with me as a parent and as a mother. I had the incredible gift of the faculty as not only my children's teachers, but mine as well. It was with tremendous gratitude that my family and I said goodbye to the school that held us close for so many years and prepared us to go out into the world...braver, more confident, and grounded with the quest for knowledge and wisdom enlivened in our souls."